Bitcoin, the leading digital currency, is now accepted at Sloto’Cash. Did you know that Bitcoin has been called the currency of the future? Bitcoin is the first decentralized currency in the world and is now accepted by over 100,000 merchants and sites online. It launched in 2009 and its value has steadily increased. In the beginning each Bitcoin was worth only $0.08 but today a single Bitcoin unit is worth over $400. It is the most used virtual currency and thousands of people around the world see it as a great investment, as its value continues to rise. With Bitcoin you can deposit safely and quickly into Sloto’Cash. Every transaction is secure and encrypted, so you can have peace of mind when purchasing credits at our casino. 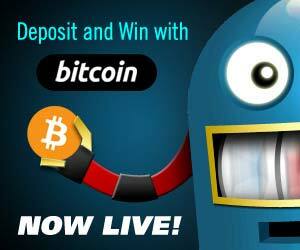 We are thrilled to have this new deposit method and invite you to open your Bitcoin Wallet to start making safe deposits into Sloto’Cash. Redeem a gigantic 300% Bitcoin Bonus up to $900 for your first Bitcoin deposit!